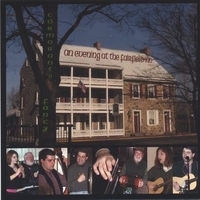 Hard-driving songs, tender ballads, spirited jigs & reels, & haunting slow airs, from Ireland, Scotland & Wales, by "the area's most energetic and spellbinding Irish Folk band," as experienced at the Fairfield Inn, where Cormorant's Fancy is house band. Cormorant's Fancy inaugural album of Irish, Scottish, and Welsh traditional and contemporary folk music features engaging arrangements with finely-honed vocal harmonies and multifaceted instrumentals, blending vocals, concertina, pennywhistles, low whistles, guitar, bouzouki, mandolin, acoustic bass, bones and bodhran, Their compelling cross-generation lineup, includes lead singer and whistle player, Margaret Folkemer, age 17 at the time of recording, her brother, Joel, two years her elder, playing acoustic bass and singing, as well as her parents, Stephen (backing vocals, concertina) and Beth (lead and backing vocals, guitar). The band's name is based on the original Irish meaning of Dan Diviney's surname (pennywhistle, low whistle, bodhran, and backing vocals). Lead singer and percussionist Andy Rosenfeld, and Curtis Rockwell, lead guitar, bouzouki, mandolin, lead and backing vocals round out a band notable for its vocal depth as much as its instrumental variety. The Fairfield Inn (thefairfieldinn.com) dating to 1757, is one of America's oldest, continuously operated inns. After the Battle of Gettysburg, the Confederate Army, retreating west through Fairfield, stopped to eat at the Inn. In its 248 years the Inn has hosted famous Americans such as Patrick Henry, Thaddeus Stevens, Generals Robert E. Lee and J.E.B. Stuart, and Dwight and Mamie Eisenhower. Joan and Sal Chandon, proprietors, perpetuate the Inn's gracious tradition. It begins softly, gently, even tenderly. But An Evening at the Fairfield Inn with Cormorant's Fancy is not to be taken lightly! The album begins with "The Old Copperplate," but the subdued sound is only the barest hint of the full Cormorant's Fancy experience. No small band, this, the CD features the talents of seven devoted musicians. However, rather than hitting their listeners with a full blast of sound from the onset, they restrain that natural tendency in favor of a delicate arrangement that tosses melody and harmony lines back and forth among the group as they shift into "The Connachtman's Rambles" and "The Lark on the Strand." The band is Dan Diviney on whistles and bodhran, Beth Folkemer on guitar, shaker, lead and backing vocals, Joel Folkemer on acoustic bass, bodhran, shaker and backing vocals, Meg Folkemer on pennywhistle, lead and backing vocals, Stephen Folkemer on concertina, keyboards and backing vocals, Curtis Rockwell on guitar, bouzouki, mandolin, lead and backing vocals, and Andy Rosenfeld on bones, tambourine, percussion, lead and backing vocals. The songs begin on track two with a rousing "Arthur McBride," followed closely by a sweet rendition of "Leatherwing Bat." "Haste to the Wedding" is another Irish instrumental, again building slowly as musicians join in the dance. "Do You Love an Apple" sounds the first sour note; no fault to the musicians, really, but it's just a bad song celebrating a good woman's love for a bad man. Fortunately, the pace picks up quickly with a spritely "I Wish You a Merry New Year/Banish Misfortune" set, the Scottish nautical ballad "The Bonnie Ship the Diamond" and the light-hearted, slightly bawdy "The Light Dragoon." A pair of Scottish songs are mixed with Irish and Shetland tunes for track nine, which clocks in at 9:35 and is by far the longest cut on the album. "The Ash Grove," a warm and lovely Welsh song, follows. The album ends with a stirring, mournful recording of "The Waves of Kilkee," an Irish air, and the stately "Amhran na Leabhar (Song of the Books)." Cormorant's Fancy is a gifted band with a knack for gorgeous arrangements. This first taste of their music has whetted my appetite for more. Let's hope they're not strangers to the studio for long.